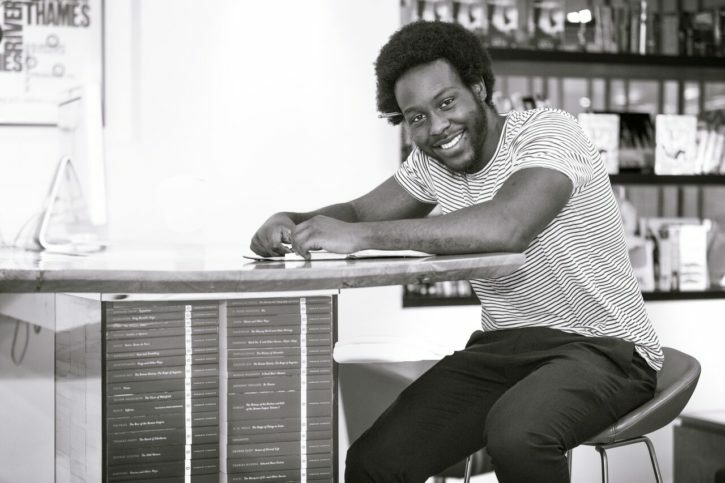 On 3 October 2016, 26 year-old Caleb Femi was announced as the new Young People’s Laureate for London 2016-17. SLAMbassadors winner Ruth Awolola caught up with Caleb to talk about his plans for the year ahead. The Laureateship has changed this year, in that you are specifically the Young People’s Laureate for London. How are you interpreting that? There’s a more concentrated focus on young people, and more of being a facilitator, so getting young people excited about reading poetry, performing poetry and writing their own poetry, as well as creating more of a normal culture of poetry amongst young people. I think it’s important for young people to understand that poetry is a way to have a voice, to be heard. If we live in a democracy, then surely every single member of society’s voice should be heard, and I think poetry is a really good way for allowing young people to cultivate their voice – it’s a good gateway. There are three amazing Young Laureates who have gone before you – has the work that those poets have done during their Laureateships influenced you? Have you had a chance to talk to them about their experiences? Immensely. I’ve been in conversation with Aisling Fahey for years, I admired her work from the first time I saw her. Selina Nwulu has been someone I’ve been in contact with more recently, I met her last year and we’ve been in good conversation since then. Warsan Shire – she’s someone who you just do not not read! Her work is a huge force. It’s been good to be in conversation with these three Laureates that came before. Is there anything in particular that you’re looking forward to doing in your role? I’m really looking forward to doing some residencies, especially one at the V&A museum – that’s going to be good. Overall I think the conversations with young people, I’m really looking forward to that. As a teacher, I’ve been in conversations for years with young people, but I don’t think it has been in this sort of way and I’m really excited to speak outside of the curriculum, outside of the parameters of school, and hear what they have to say without that filter. As well as being the Young People’s Laureate, you’ve also been a teacher, and I’ve seen your documentaries and your photography – I love Heartbreak and Grime so much! How do you manage to juggle your time? That’s easy. Don’t sleep! I’m very restless, so having spare time is something that really, really gets to me, and I want to fill it in one way or the other. I’m curious as to how much poetry can be infused into other artistic forms, into other elements of society. Who are the poets that have had the biggest influence on you so far? I‘ve always been obsessed with all the classics, with all the pre-20th century poets. The first poem that genuinely caught my attention was Paradise Lost, because it was weird! I read from Books One to Ten and it was just fascinating, and it was the first time that my idea of what poetry was, was really challenged. In terms of writing poetry, Robert Frost’s ‘Mending Wall’ was the poem where I suddenly thought, I can do this too. The poem’s so simplistic, but there’s so much within it. If we fast-forward, I think Andrew McMillan’s physical is a fantastic collection. 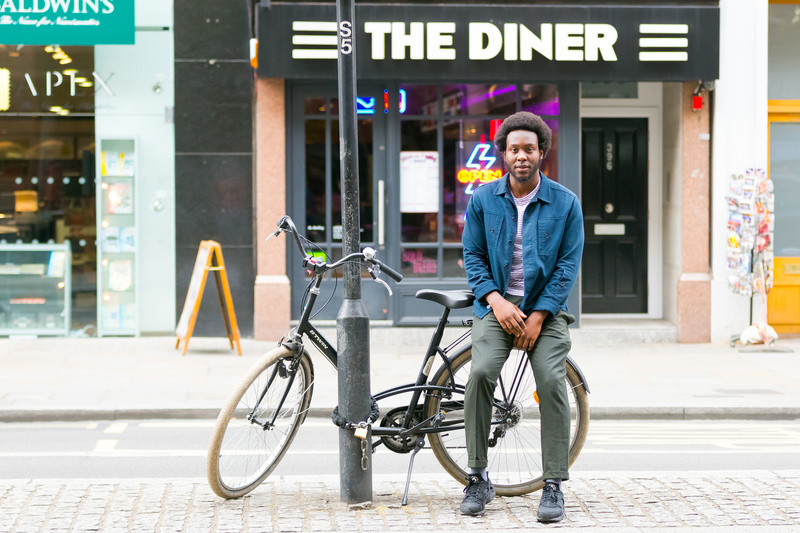 Sarah Howe’s Loop of Jade was challenging and I appreciated it for that – it encouraged me to push my writing further, and so did Kayo Chingonyi’s Some Bright Elegance – his work is amazing. As a student, my dissertation was on Emily Dickinson – her life was so interesting, she was incredibly particular about who got to read her poems, and that’s something that I’ve always admired in her work, that it’s brilliant and she didn’t care what you felt about it! And sometimes that humbles me as a poet, that first and foremost this poem is for me. You are the Young People’s Laureate for London – but your own influences come from all over the world, so how do you think that will work with your role? Fantastically well, because London is so multi-cultural, so I think it’s an advantage and it allows me to empathize with a wider variety of people, to be in conversation with many other cultures. There are so many elements about me that are rooted in other people’s cultures, as well as the cultures of this country. So London is like a really good cocktail, and it works well because I’m part of it, I understand the conversation. You won the Roundhouse Poetry Slam in 2015. How was that for you? I actually used to hate slam! For about three years, before 2015, I’d always been very anti-slam. I thought, ‘how can you judge poetry, it’s a personal thing’. A friend of mine eventually said, ‘Why don’t you just enter a slam, so you can understand it. Do you actually understand it?’ I thought, that’s true, and the age limit on the Roundhouse Slam was 25, I’d just turned 25 – it was my last chance to do something, so I applied for it. And on the day of the final, I said to myself, ‘No, I don’t want to do this’. 15 minutes till I go on stage – ‘No, I don’t want to do this’. But in the end I did it – I had no expectations. And I won. So that was a good eye-opener. And regardless of whether I won or not, I think I learnt a lot about the whole culture of slam and why people do it. 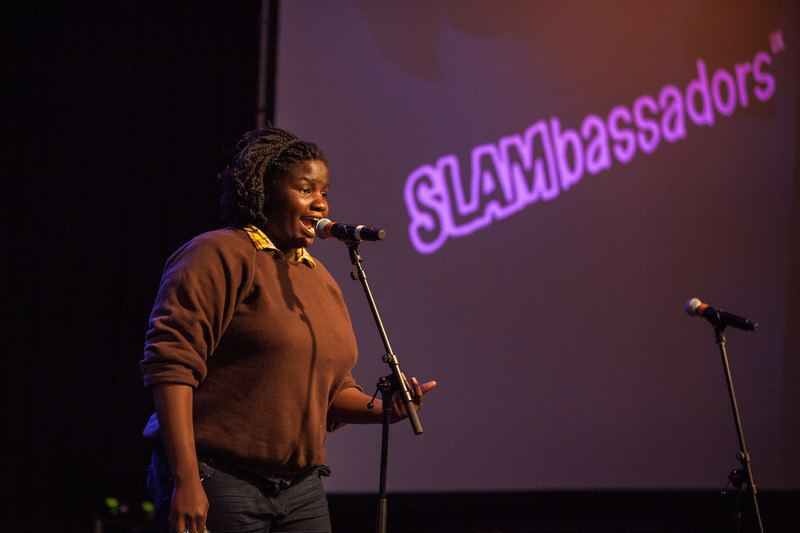 Do you think slam is a good thing for emerging writers to get involved in? I think it’s a good thing for emerging writers to try and exercise their writing in all forms. I don’t think someone should be an expert in just one thing – ‘I’m a slam poet and all I do is slam’ – I think it’s good to try and spread yourself out into other forms of poetry, because they all inform each other. Page poetry informs performance, informs slams. It makes you stronger as a poet. You don’t want to be that footballer who runs really fast but is terrible at everything else – it won’t work! You have to be a rounded writer. You are the first male Young Laureate, and it’s often said that it’s difficult to get more boys and young men interested in poetry. What do you think can be done about that? I think that trying to have a conversation first with boys – why do they feel like that? – is important. If we don’t have a diagnosis, we can’t start fixing the issue. I have a few ideas, I know why I may have been dissuaded from it when I was younger, so it’s good to start having a conversation. What’s been the biggest challenge you’ve faced so far as a poet? The next poem. That is the biggest challenge. When you’re in the process of writing a poem, it’s the most rewarding experience, but once that’s done, there’s a new expectation, a new weight on you. Sometimes the next poem comes, sometimes it doesn’t, and that can be quite difficult; you think, what’s wrong, am I broken? Other than that, it’s trying to get your work read, or heard. That’s difficult, trying to stay strong when other people don’t get your work, because not everyone will get it, not everyone will like it. I think if everyone gets your work, you’re either the best poet in the world, or you’re the most unaware poet in the world. You shouldn’t be universally liked as a poet – if you are, that’s it, you’ve won poetry and everyone else should stop! If there’s one thing that you’d like to have done, or have changed, by the end of your Laureateship, what would that be? I would like poetry to be normalised outside of academic spaces by young people. I want to walk down the street, or be on a bus, and there are two young people and one decides to read some poetry, or I look at social media and there’s a recording of a group of young people reciting a poem. I want it to be something that’s on all platforms. That’s a huge task, it sounds very utopian, but I think we can start taking some of the steps to get there. Read poetry. You can’t say that you do poetry if you don’t read it. It’s like saying that you’re a singer, but you don’t listen to music, it doesn’t make sense. You need to understand the wider landscape of where you are, who you like, who you don’t like, what this person does with technique, what this person does with form and structure – and ultimately, what you want to do. If you’ve seen what everyone else does, then you think, OK, now what can I do? 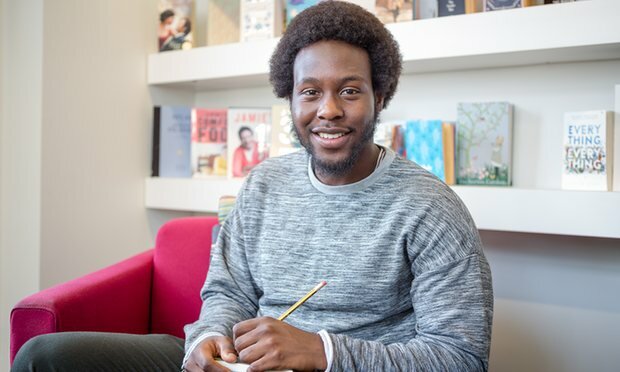 During his year as Laureate, Caleb will head the panel of judges for the new Young People’s Poetry Prize, and co-host the Young People’s PoetryLab and the Young People’s Poetry Salon, aimed at helping young writers to develop their work. You can find out more about Caleb and his work here, and keep any eye on Spread the Word for the latest news and updates about Caleb’s experiences as Laureate. Ruth Awolola was a SLAMbassadors winner in 2015. Listen to Ruth performing her winning poem, ‘Sorry’. The Young People’s Laureate for London is an initiative developed by Spread the Word, London’s writer development agency. Young Poets Network would like to thank Spread the Word for their support with this interview.